It is hard to believe we are wrapping up this leg of the journey. While our focus has been on the walleye pollock for this survey, we have encountered some other critters in our midwater and bottom trawls, and on our nightly DropCam excursions. We’ve even had some neat finds in our Methot net. There is quite a diverse ecosystem both in and out of water around Kodiak, and I’d like to take a moment to highlight some of the critters we’ve caught in our trawls and on camera. One other neat thing happened on one of our final trawls of the leg. We caught several Dusky rockfish in our bottom trawl, and they were easy to spot as we sorted the trawl because of the large size and dark color. Several of these rockfish had bloated bellies as well. Being the curious scientists we were, we decided to dissect a couple of the rockfish to find out why. Some of them had very inflated swim bladders, while others turned out to be very pregnant females. We pulled out the ovaries, and they were about the size of a water balloon! Millions of tiny eggs poured out of one that we accidentally nicked with the scalpel. We took some of those and looked at them under the microscope. Rockfish are actually viviparous, which means they give birth to live young. Did you know? The Arctic lamprey’s life cycle is similar to salmon. They are born in freshwater, leave for the ocean, and return to the same freshwater they were born in to spawn. Check out those lamprey suckers! Once again, my experience as a Teacher at Sea has amazed me, and I have taken away so many great experiences I can’t wait to share with my students. While the science was quite different on the Oscar Dyson in comparison with the Groundfish Survey on the Oregon II, there are many similarities in the experiences themselves which make this a valuable program for educators. I formed relationships and made connections with people I may never have encountered, and these relationships have been (and will continue to be) invaluable to my teaching. The fearless navigators of the Oscar Dyson and me on our final day. Science is everywhere! From the lab, to the bridge, to the engineering rooms, there is science in everything we do! Push-ups are a little more difficult in 4ft swells. Even in the field, scientists are making (and verbalizing) hypotheses, and they are always asking questions about the work they are doing, even in the middle of an experiment or project. Alaska has an abundance of jellyfish in all colors and sizes. The shape of an otolith is unique for every species of fish. Everyone looks funny when they are trying to walk during rough seas, even the experienced sea folk. Different types of scientists work together toward a common goal, each bringing their unique backgrounds to the work they are doing. Trust is crucial when you live and work on a ship, as each person on board is a member of a team; that team is like your family. Everyone has a story. Take a moment, and find it out. I want to thank everyone that works on the Oscar Dyson for making this experience a memorable one. I enjoyed working with everyone on board, and will cherish the relationships I formed. This final post wouldn’t be complete without Wilson, our infamous shark who had fun on his trip too. Here he is highlighting his adventures with all the people and places on board the Oscar Dyson! 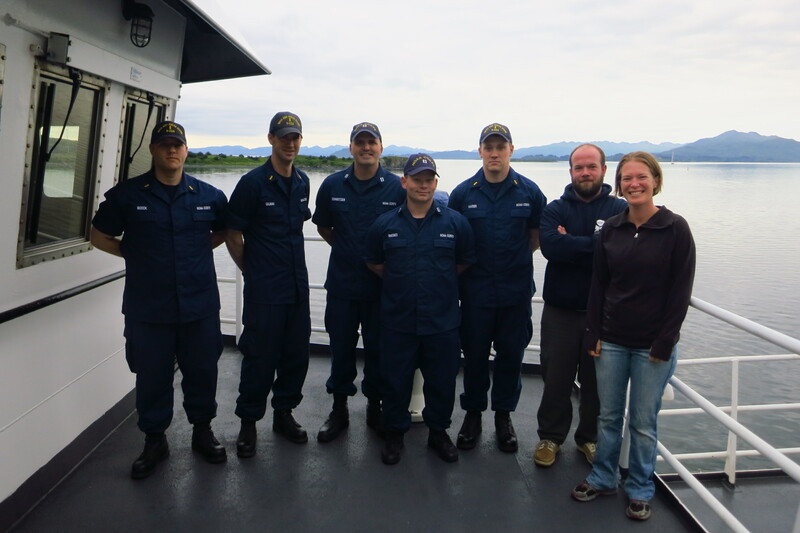 This entry was posted in 2015, Andrea Schmuttermair 2015, NOAA Fisheries Service, NOAA Teacher at Sea and tagged Alaska, dusky rockfish, Pollock Survey, science. Bookmark the permalink.